Worldwide, research methods and statistics together constitute a major component of a typical psychology undergraduate degree. This is certainly the case in the UK, where the British Psychological Society requirements entail that more or less one third of the content on its accredited undergraduate degrees is devoted to research methods and statistics. It is well documented, however, that students often perceive these subjects as difficult, unstimulating or even possibly unrelated to what they believe to be the real subject matter of psychology. Teaching research methods therefore presents a major pedagogical challenge for many, if not all, psychology departments. 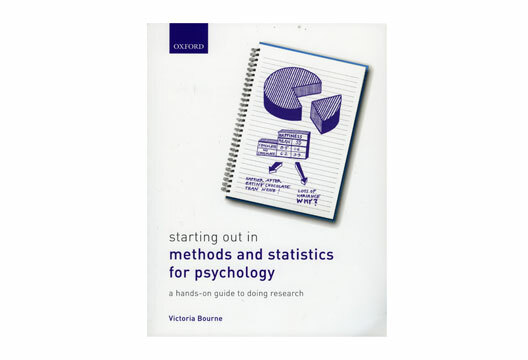 The recently published Starting out in Methods and Statistics for Psychology by Victoria Bourne seems well prepared for this teaching challenge. It does everything possible to make research methods and statistics accessible, engaging and relevant. It is written with genuine enthusiasm for research, and with a clear writing style that presents the material in as straightforward a manner as possible. Although it is not a long or dense book, it is surprisingly comprehensive and covers all the major foundational issues related to research, including study design, ethics, literature reviewing, report writing, introductory statistics, and even many more intermediate-level statistical methods. In a sense, all the core concepts and skills that we expect our undergraduate students to learn from their many years of research methods and statistics training are contained in this one accessible and friendly book. That’s no mean feat. On the other hand, can accessibility be obtained without paying the price of precision? Throughout the book, statistical concepts are sometimes presented in a manner that, while intuitive and accessible, is ultimately incorrect. For example, we’re told that a t-statistic is a ratio of between group variance to within-group variance, that Pearson’s correlation coefficient is the ratio of the covariance between variables to variance within variables, that parametric statistical tests require approximately normally distributed data, homogeneity of variance, and independent observations, that the p-value is the probability of making a Type I error, that a 95 per cent confidence interval means that we can be 95 per cent confident that the population mean is within its upper and lower limits. All of these statements are technically incorrect. Some may argue that these are harmless inexactitudes and that it is just pedantic to quibble over precise definitions. Moreover, if being accessible to students comes at the price of being formally incorrect, isn’t that a price worth paying? These are debatable points. Personally, I’m not sure that being imprecise is ever harmless. In any case, I’ll cling to the belief that research methods and statistics don’t actually have to choose between being accessible and being precise, and that it is possible to be both.